Tax Refund Watch 2015: Will Your Refund Be Delayed? 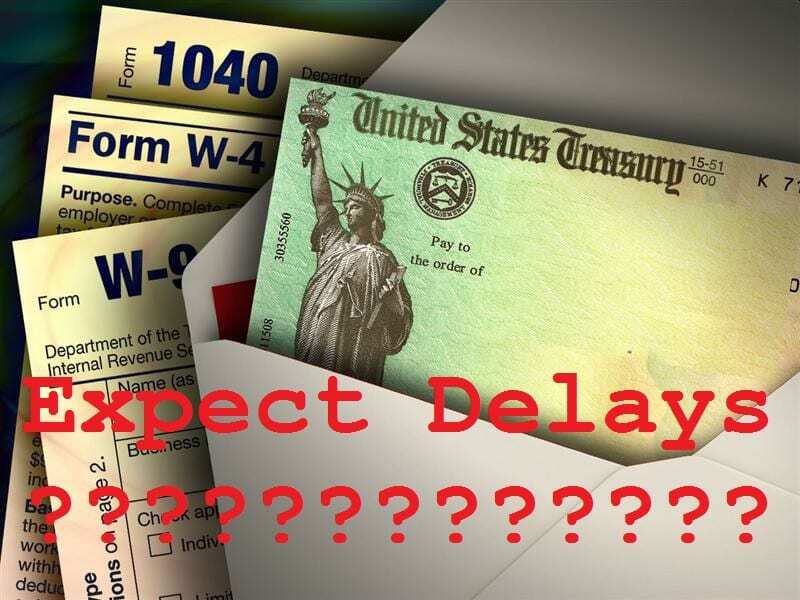 One of my more popular blogs each year is my update on whether the Internal Revenue Service anticipates any delay in issuing refunds. In years past, the government shutdown, automation changes, and federal government budget issues have had an impact on when the IRS would start issuing refunds. This year the most important reason for posting this blog is to dispel misinformation about delays during the coming tax refund season. There is at least one thread of information on the internet that says that refunds next year will be delayed until October. I know this would disappointment, if not anger, many of you who plan religiously for the refund. This information has been confirmed to be unreliable. So you can stop planning the revolution now. The IRS generally begins accepting tax returns towards the end of January, with a target date of sending out the tax refund about 14 days later. This varies slightly from year to year. I have listed several things in the past that have affected this timeline. Right now there is still a possibility that a delay could occur as a result of Congress not making a decision on whether to extend several provisions of the tax code that expired last year. The last minute decision making puts the Internal Revenue Service into a scramble to adjust their systems to provide for changes. It is these adjustment, especially when the IRS is given little time, that generally cause a delay in the tax returns being processed, and the refunds going out to eager taxpayers. Congress has approximately 50 provisions to review to decide whether to extend. In addition, their October recess took valuable time out of the timeline. Since 2006, similar last minute decision making has impacted refunds going out three (3) times. While it is impossible to give an exact answer now, my guess is there will be a slight delay in the date when returns will be accepted. Last year, selected returns were apparently accepted as early as January 24, with most returns being processed after January 28th. If you opted for electronic deposit, the money was in your account for early filers, in about 10 days. If you opted for a paper check, it took about another week. RULE TO REMEMBER: If you file early, you receive your refund faster. Charts of filing and refund receipts indicate that those that file in the first two weeks get their refunds faster than those that file later. This even applies to those that file later in February. It makes sense. Many people reading this blog have financial issues which make them vulnerable to garnishment, or even having their refund captured. I invite you to read my blog “How to Protect Your Tax Refund” to make sure this vital surge of cash is not taken by your creditors. If you are vulnerable then also read this – “Can My Creditors Grab My Tax Refund?”. As always the attorneys and staff of The Merna Law Group are available to answer your questions regarding how bankruptcy can end your financial stress and rebuild your credit.